Warner Bros. action film Justice League only hit theaters in the US a couple weeks ago, but already the Blu-ray Disc and 4k Ultra HD Blu-ray are available for pre-order. The Ultra HD Blu-ray combo edition, the specs of which we don’t have yet, will contain a 4k Blu-ray, Blu-ray, and Digital Copy, while the Blu-ray combo edition will include a DVD and Digital Copy. The movie releases to digital on Feb. 13, then to disc on Mar. 13, 2018. 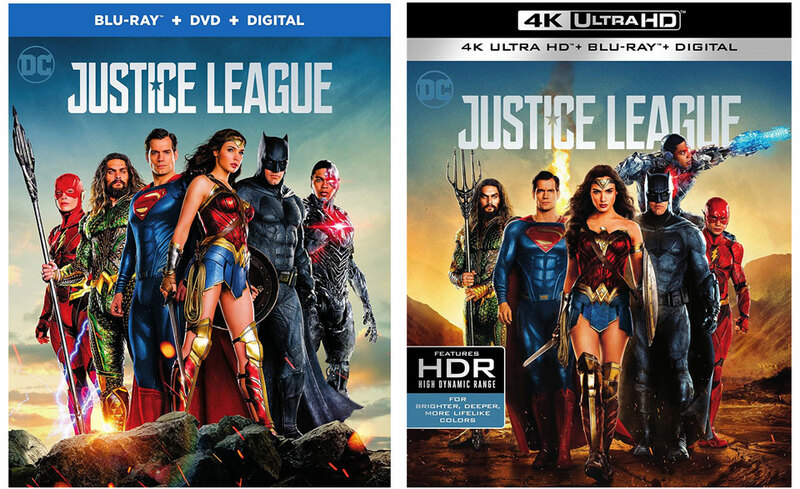 On Blu-ray and 4k Blu-ray Justice League is presented in 1.85:1 (16×9) widescreen aspect ratio in either 1080p and 2160p (4k), respectively. The Ultra HD Blu-ray edition also features HDR (High Dynamic Range) color via Dolby Vision. Both Blu-ray editions also feature audio in Dolby Atmos, as well as DTS-HD Master Audio, and 5.1 soundtracks channel in English, French and Spanish. There are also some Special Features included on the Blu-ray editions, including digital copies (via Movies Anywhere) and the extras “Heart of Justice,” “Technology of the Justice League,” “Justice League: The New Heroes,” “Suit Up: The Look of the League,” and more. The Ultra HD Blu-ray edition of Justice League carries an MSRP of $44.99 and pre-orders are selling for $29.99. The Blu-ray edition is currently priced $24.99. And, there’s a 3D edition listed at $44.95 (although cover art hasn’t been released). See updated pre-order pricing from Amazon below. Justice League was directed by Zack Snyder and stars Ben Affleck, Henry Cavill, Gal Gadot, Ezra Miller, Ray Fisher and Jason Momoa as the Justice League team heroes. The film so far has made $174M domestically, and $310M outside of the United States.